The Early Birds of Aviation is an organization devoted to the history of early pilots. The organization was started in 1928 and accepted a membership of 598 pioneering aviators. Fort Erie is a town on the Niagara River in the Niagara Region, Ontario, Canada. It is directly across the river from Buffalo, New York and is the site of Old Fort Erie which played a prominent role in the War of 1812. 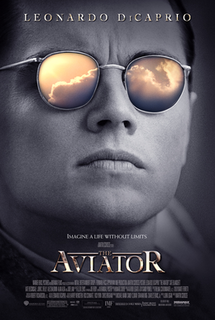 The Aviator is a 2004 American epic biographical drama film directed by Martin Scorsese and written by John Logan. It stars Leonardo DiCaprio as Howard Hughes, Cate Blanchett as Katharine Hepburn, and Kate Beckinsale as Ava Gardner. The supporting cast features Ian Holm, John C. Reilly, Alec Baldwin, Jude Law as Errol Flynn, Gwen Stefani as Jean Harlow, Kelli Garner as Faith Domergue, Matt Ross, Willem Dafoe, Alan Alda, and Edward Herrmann. Crystal Beach is a community within Fort Erie, Ontario, Canada with a population of 8,524 at the time of the 2016 census. It was named for the "crystal-clear" water conditions present when it was founded on the northeast shore of Lake Erie, across from Buffalo. More recently, however, water quality can be a problem in the area. Antony Habersack Jannus, more familiarly known as Tony Jannus, was an early American pilot whose aerial exploits were widely publicized in aviation's pre-World War I period. He flew the first airplane from which a parachute jump was made, in 1912. Jannus was also the first airline pilot, having pioneered the inaugural flight of the St. Petersburg–Tampa Airboat Line on January 1, 1914, the first scheduled commercial airline flight in the world using heavier-than-air aircraft. The Tony Jannus Award, created to perpetuate his legacy, recognizes outstanding individual achievement in the scheduled commercial aviation industry and is conferred annually by the Tony Jannus Distinguished Aviation Society founded in Tampa, Florida, in 1963. Thomas Scott Baldwin was a pioneer balloonist and U.S. Army major during World War I. He was the first American to descend from a balloon by parachute. Georgia Ann Thompson Broadwick, or Georgia Broadwick, was an American pioneering parachutist. She was nicknamed 'Tiny', as she weighed only 85 pounds (39 kg) and was 5 feet (1.5 m) tall. She invented the ripcord. Adolphe Célestin Pégoud was a French aviator and flight instructor who became the first fighter ace in history during World War I.
Otto William Timm was a California-based barnstormer and aircraft manufacturer of German descent. Charles Lindbergh's first flight was flown by Timm. Timm partnered at times with his brother Wally Timm who did a lot of flying for the nascent Hollywood movie industry. The Curtiss Flying School was started by Glenn Curtiss to compete against the Wright Flying School of the Wright brothers. The first example was located in San Diego, California. The Canadian Aviation Corps (CAC) was an early attempt to create an air force for Canada at the beginning of the First World War. The unit was created in 1914 and was attached to the Canadian Expeditionary Force. The CAC had a maximum strength of three personnel and one aircraft which was delivered but never used. By May 1915, the unit had ceased to exist. Parachute Jumper is a 1933 American pre-Code black-and-white drama film that was directed by Alfred E. Green. Based on a story by Rian James titled "Some Call It Love", the screen production stars Douglas Fairbanks Jr., Bette Davis and Frank McHugh. Phoebe Jane Fairgrave Omlie was an American aviation pioneer, particularly noted for her accomplishments as an early female aviator. Omlie was the first woman to receive an airplane mechanic's license, the first licensed female transport pilot, and the first woman to be appointed to a federal position in the aviation field. Logan Archbold "Jack" Vilas was an aviation pioneer and a member of the Early Birds of Aviation. He was inducted into the Wisconsin Aviation Hall of Fame in 2000. Flight Lieutenant Edward Rodolph Clement Scholefield 1893-1929 DCM AFC was an aviator and a motor racing driver. He was killed during a test flight of a Vickers Vanguard airliner in 1929. Edward H. Phillips is an American writer/historian, aviation industry reporter, and aviator who has specialized in the general aviation industry of the central United States—with particular emphasis on the aviation history of Wichita, Kansas and its aircraft manufacturers. This Canadian biographical article is a stub. You can help Wikipedia by expanding it.